Action-packed luxury yacht charters are all about indulgence and fun, but if you want to enjoy all the delights of being on board, then you might want to select a superyacht with a gym and/or spa on board. Whether you dream of exercising while taking in the sea views or enjoying a relaxing beauty treatment, there is a wide range of choices available. Here are some of the best luxury yachts available for charter for self-care fans: Titania Fresh from a major interior refit Titania is packed with features to help you enjoy an active charter. The 73 metre Lurssen has a climate-controlled gymnasium and a personal trainer on board to help tailor a personal plan to achieve your goals. There is also plenty of fun to be had on the water as she has a complete water park that can be deployed from her beach club. This includes a trampoline, climbing frame and one of the largest superyacht slides ever built, which is 13 metres high. If you are looking for a spot of pampering after your workout Titania has a beauty therapist and hairdresser on board who can offer a range of treatments in the dedicated spa room. Her crew of 21 also includes two Michelin-trained head chefs that can follow any specific diet plans or requirements. With accommodation for up to 12 guests in seven cabins, including two master suites, her new light interior offers plenty of spaces to relax in. Other stand out features include her beach club, which has a sauna and a bar and be converted into a nightclub, and a large pool with swim-up bar located on her upper deck. Titania is managed for charter by Burgess and her weekly charter rate starts from €525,000. Action-packed luxury yacht charters are all about indulgence and fun, but if you want to enjoy all the delights of being on board, then you might want to select a superyacht with a gym and/or spa on board. Fresh from a major interior refit Titania is packed with features to help you enjoy an active charter. 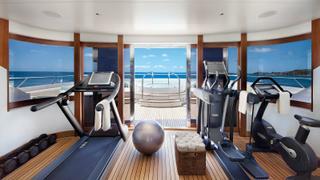 The 73 metre Lurssen has a climate-controlled gymnasium and a personal trainer on board to help tailor a personal plan to achieve your goals. There is also plenty of fun to be had on the water as she has a complete water park that can be deployed from her beach club. 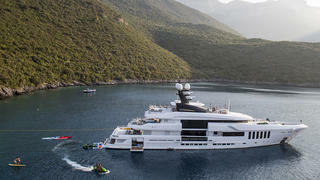 This includes a trampoline, climbing frame and one of the largest superyacht slides ever built, which is 13 metres high. If you are looking for a spot of pampering after your workout Titania has a beauty therapist and hairdresser on board who can offer a range of treatments in the dedicated spa room. Her crew of 21 also includes two Michelin-trained head chefs that can follow any specific diet plans or requirements. With accommodation for up to 12 guests in seven cabins, including two master suites, her new light interior offers plenty of spaces to relax in. Other stand out features include her beach club, which has a sauna and a bar and be converted into a nightclub, and a large pool with swim-up bar located on her upper deck. Titania is managed for charter by Burgess and her weekly charter rate starts from €525,000. Guests can enjoy a more adrenaline-pumping workout with Firebird, which offers ski touring using the yacht as a mobile base camp in Arctic Norway. Guests can hike up mountains and ski untouched powder with a personal IFMGA Swiss mountain guide. During the summer months, she can be chartered off the Damation Coast where guests can enjoy plenty of sailing action alongside a healthy Mediterranean menu. Additionally, the onboard chef is also a yoga instructor and provides private lessons on the deck surrounded by beautiful scenery. Delivered in 2016 by Oyster, 27.08 metre Firebird can sleep up to seven guests in four cabins. Below deck she features a sleek main saloon with vast windows and a dining/lounge area. Up on deck, there are numerous sunbathing spots, comfy sofas and an al fresco dining area. Her charter rate starts from €45,000 per week for the Mediterranean season and €47,700 all inclusive for Norway. For more information email charter@firebird-yachting.com. Guests can enjoy a more adrenaline-pumping workout with Firebird, which offers ski touring using the yacht as a mobile base camp in Arctic Norway. Guests can hike up mountains and ski untouched powder with a personal IFMGA Swiss mountain guide. During the summer months, she can be chartered off the Damation Coast where guests can enjoy plenty of sailing action alongside a healthy Mediterranean menu. Additionally, the onboard chef is also a yoga instructor and provides private lessons on the deck surrounded by beautiful scenery. Delivered in 2016 by Oyster, 27.08 metre Firebird can sleep up to seven guests in four cabins. Below deck she features a sleek main saloon with vast windows and a dining/lounge area. Up on deck, there are numerous sunbathing spots, comfy sofas and an al fresco dining area. Her charter rate starts from €45,000 per week for the Mediterranean season and €47,700 all inclusive for Norway. For more information email charter@firebird-yachting.com. Escape on a luxurious wellness break in the Med on board 50 metre Admiral superyacht Ouranos, which can sleep up to 12 guests in six cabins. Delivered in 2016, she boasts a wellness hub within the beach club terrace aft. Here guests can work out in the fully-equipped gym before heading to the treatment area for a massage or to the steam room. Additionally, her fold-down balconies are the perfect spot for some waterside yoga. Her other on-board highlights include a beautiful contemporary main saloon and dining area, a gorgeous TV lounge and a dedicated cocktail bar. Out on deck, there's a Jacuzzi surrounded by sunpads on the sundeck as well as numerous al fresco lounge and dining areas. Managed for charter by IYC and based in the Mediterranean, she has a weekly rate starting from €210,000. Escape on a luxurious wellness break in the Med on board 50 metre Admiral superyacht Ouranos, which can sleep up to 12 guests in six cabins. Delivered in 2016, she boasts a wellness hub within the beach club terrace aft. 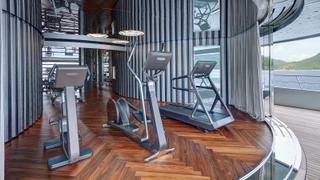 Here guests can work out in the fully-equipped gym before heading to the treatment area for a massage or to the steam room. Additionally, her fold-down balconies are the perfect spot for some waterside yoga. Her other on-board highlights include a beautiful contemporary main saloon and dining area, a gorgeous TV lounge and a dedicated cocktail bar. Out on deck, there's a Jacuzzi surrounded by sunpads on the sundeck as well as numerous al fresco lounge and dining areas. Managed for charter by IYC and based in the Mediterranean, she has a weekly rate starting from €210,000. Do wellness the Finnish way on board 63 metre Lady Britt, which features a traditional sauna with an ocean-level platform so guests can step out of the heat and dive straight into the cool waves. Additionally, the on-board spa boards a qualified Elemis beautician and the sundeck gym boasts panoramic views and state-of-the-art Technogym equipment and tech. Delivered in 2011 by Feadship, Lady Britt can sleep up to 12 guests in seven cabins with a crew of 16. Her expansive interiors feature an elegant dining room, private study, cinema, an aft guest saloon and a beautiful main saloon complete with vast windows and cocktail bar. Her on deck highlights include an al fresco cinema, spa pool, sunpads, dining area and lounge up on the sundeck, as well as additional eating spots and relaxation spaces on the lower decks. Managed for charter by Edmiston, Lady Britt has a weekly summer charter rate starting from €445,000 in the low season and €470,000 in the high season. In the winter, her weekly rate starts from $445,000 in the low season and $470,000 in the high season. Do wellness the Finnish way on board 63 metre Lady Britt, which features a traditional sauna with an ocean-level platform so guests can step out of the heat and dive straight into the cool waves. Additionally, the on-board spa boards a qualified Elemis beautician and the sundeck gym boasts panoramic views and state-of-the-art Technogym equipment and tech. Delivered in 2011 by Feadship, Lady Britt can sleep up to 12 guests in seven cabins with a crew of 16. Her expansive interiors feature an elegant dining room, private study, cinema, an aft guest saloon and a beautiful main saloon complete with vast windows and cocktail bar. Her on deck highlights include an al fresco cinema, spa pool, sunpads, dining area and lounge up on the sundeck, as well as additional eating spots and relaxation spaces on the lower decks. Managed for charter by Edmiston, Lady Britt has a weekly summer charter rate starting from €445,000 in the low season and €470,000 in the high season. In the winter, her weekly rate starts from $445,000 in the low season and $470,000 in the high season. 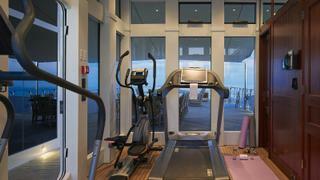 The gym on board Joy has plenty of the latest equipment to keep you busy while on board. Free weights, a bench press, elliptical, treadmill, exercise bike and much more, as well as huge windows for brilliant views of your surroundings. This beautiful hybrid space spans indoors and out on the bridge deck, making it an inviting spot on board. Additionally, she boasts a spa room and an on-board masseuse. Out on deck, she boasts numerous al fresco dining areas and lounges aft while her foredeck is used for games of basketball and badminton. Delivered in 2016 by Feadship, the 70 metre Joy is centred around comfort and can sleep up to 12 guests in eight cabins with a crew of 19. Her highlights include a stunning skylounge cocktail bar and a beach club that can be converted into a disco room. Managed for charter by Burgess, Joy has a weekly rate starting from €700,000 in the low season and €840,000 in the high season. 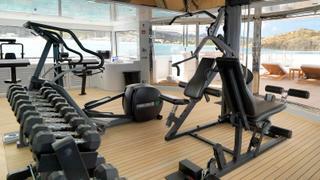 The gym on board Joy has plenty of the latest equipment to keep you busy while on board. Free weights, a bench press, elliptical, treadmill, exercise bike and much more, as well as huge windows for brilliant views of your surroundings. This beautiful hybrid space spans indoors and out on the bridge deck, making it an inviting spot on board. Additionally, she boasts a spa room and an on-board masseuse. Out on deck, she boasts numerous al fresco dining areas and lounges aft while her foredeck is used for games of basketball and badminton. Delivered in 2016 by Feadship, the 70 metre Joy is centred around comfort and can sleep up to 12 guests in eight cabins with a crew of 19. Her highlights include a stunning skylounge cocktail bar and a beach club that can be converted into a disco room. Managed for charter by Burgess, Joy has a weekly rate starting from €700,000 in the low season and €840,000 in the high season. Enjoy spectacular views while you work up a sweat in the enclosed sundeck gym on board 49.9 metre Eleni, which features floor-to-ceiling glass windows and sliding doors. Afterwards, bubble away in the spa pool forward or snooze atop its surrounding sunpads. Additionally, her deck spaces feature a vast al fresco lounge, perfect for sundowners, and a large dining area. Delivered in 2005 by CBI Navi, she can sleep up to 12 guests in six cabins, which includes a full-beam master cabin on the main deck, with a crew of 11. Her onboard highlights include a spacious main saloon complete with vast TV and dining area, a private office and an elegant skylounge bar. Managed for charter by Y.CO, she has a weekly rate starting from €175,000. Enjoy spectacular views while you work up a sweat in the enclosed sundeck gym on board 49.9 metre Eleni, which features floor-to-ceiling glass windows and sliding doors. Afterwards, bubble away in the spa pool forward or snooze atop its surrounding sunpads. Additionally, her deck spaces feature a vast al fresco lounge, perfect for sundowners, and a large dining area. Delivered in 2005 by CBI Navi, she can sleep up to 12 guests in six cabins, which includes a full-beam master cabin on the main deck, with a crew of 11. Her onboard highlights include a spacious main saloon complete with vast TV and dining area, a private office and an elegant skylounge bar. Managed for charter by Y.CO, she has a weekly rate starting from €175,000. Tucked into a spacious beach club with fold down terraces on board Here Comes The Sun, guests will find a wellness and spa centre, which features an elegant lounge area, steam shower, sauna, treadmill, exercise bike, cable machine, weights and yoga mats. Other onboard highlights include a study, a movie theatre and a vast main saloon complete with a dining area, grand piano, cocktail bar and masses of comfy seating. Up on deck, she has a spacious sundeck complete with Jacuzzi and an infinity pool on the main aft deck with a swim-up bar. Delivered in 2017 by Amels, the 83 metre superyacht can sleep up to 12 guests in 10 cabins, with a crew of 25. Managed for charter by Fraser, Here Comes The Sun will be cruising the coast of Mexico this winter, with a weekly rate starting from €1,200,000. Tucked into a spacious beach club with fold down terraces on board Here Comes The Sun, guests will find a wellness and spa centre, which features an elegant lounge area, steam shower, sauna, treadmill, exercise bike, cable machine, weights and yoga mats. Other onboard highlights include a study, a movie theatre and a vast main saloon complete with a dining area, grand piano, cocktail bar and masses of comfy seating. Up on deck, she has a spacious sundeck complete with Jacuzzi and an infinity pool on the main aft deck with a swim-up bar. Delivered in 2017 by Amels, the 83 metre superyacht can sleep up to 12 guests in 10 cabins, with a crew of 25. Managed for charter by Fraser, Here Comes The Sun will be cruising the coast of Mexico this winter, with a weekly rate starting from €1,200,000. The 63.1 metre Sunrise superyacht Irimari offers a stunning water-level beach lounge complete with its own balcony, sauna and expansive gym. Delivered in 2015, she can accommodate 12 guests in six luxurious cabins. Her contemporary interiors feature an interactive games room and a beautiful skylounge complete with cinema and piano. Out on deck, guests can relax in the vast jet stream spa pool on the sundeck, which sits near idyllic sunbathing spots, a wet bar and a teppanyaki grill. 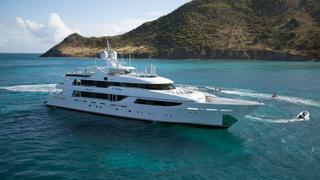 Luxury Yacht Group manages Irimari for charter and her weekly rate is available on request. The 63.1 metre Sunrise superyacht Irimari offers a stunning water-level beach lounge complete with its own balcony, sauna and expansive gym. Delivered in 2015, she can accommodate 12 guests in six luxurious cabins. Her contemporary interiors feature an interactive games room and a beautiful skylounge complete with cinema and piano. Out on deck, guests can relax in the vast jet stream spa pool on the sundeck, which sits near idyllic sunbathing spots, a wet bar and a teppanyaki grill. 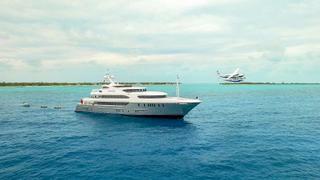 Luxury Yacht Group manages Irimari for charter and her weekly rate is available on request. Delivered by Sanlorenzo in 2017, the 52 metre superyacht Seven Sins features a fully-equipped gymnasium on board, as well as a sauna, hammam, steam room and shower. Additionally, there is a glass-bottom pool with a counterflow current option for competitive swimmers who wish to avoid the waves. Aft of the spa lies an extraordinary beach club, which has balconies on both sides and can be transformed into a tender garage. Her sleek and contemporary deck spaces feature plenty of dining, drinking and lounging spots for guests. Inside the first Sanlorenzo 52 Steel yacht up to 10 guests can be accommodated on board in five cabins and will be catered for by a crew of 11. The interior also features a vast, elegant main saloon that is filled with natural light thanks to the generous use of glass throughout. Managed for charter by YPI, she has a weekly summer rate starting from €270,000 in the low season and €285,000 in the high season. In the winter season, her low season rate starts from $255,000 and her high season rate starts from $280,000. Delivered by Sanlorenzo in 2017, the 52 metre superyacht Seven Sins features a fully-equipped gymnasium on board, as well as a sauna, hammam, steam room and shower. Additionally, there is a glass-bottom pool with a counterflow current option for competitive swimmers who wish to avoid the waves. Aft of the spa lies an extraordinary beach club, which has balconies on both sides and can be transformed into a tender garage. Her sleek and contemporary deck spaces feature plenty of dining, drinking and lounging spots for guests. Inside the first Sanlorenzo 52 Steel yacht up to 10 guests can be accommodated on board in five cabins and will be catered for by a crew of 11. The interior also features a vast, elegant main saloon that is filled with natural light thanks to the generous use of glass throughout. Managed for charter by YPI, she has a weekly summer rate starting from €270,000 in the low season and €285,000 in the high season. In the winter season, her low season rate starts from $255,000 and her high season rate starts from $280,000. Before you tuck into a sumptuous breakfast on Siren's fold-out balcony in the master suite, work up a sweat in the beach club gym with a water level view and advice from the on-board personal trainer. Alternatively, indulge in a beauty treatment or massage to start your day right. 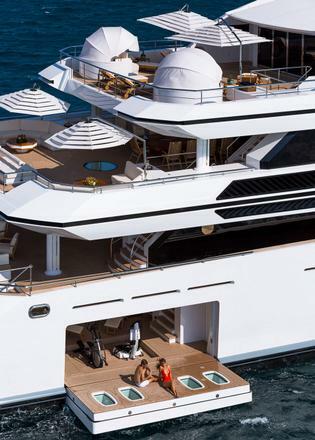 Delivered in 2008 by Nobiskrug and refitted in 2013, 73.5 metre Siren has a myriad of onboard highlights, such as a helipad, an expansive sundeck complete with a lounge area and a sea pool surrounded by sunpads, while a bar and al fresco dining can be found on the main deck aft. Below deck, she boasts a movie theatre, a vast and contemporary main saloon with dining area, an owner's office and an elegant skylounge. Managed for charter by Burgess, Siren has a weekly summer rate starting from €553,000 in the low season and €623,000 in the high season. 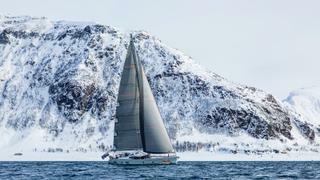 During winter, she has a weekly rate starting from €490,000 in the low season and €550,000 in the high season. Before you tuck into a sumptuous breakfast on Siren's fold-out balcony in the master suite, work up a sweat in the beach club gym with a water level view and advice from the on-board personal trainer. Alternatively, indulge in a beauty treatment or massage to start your day right. Delivered in 2008 by Nobiskrug and refitted in 2013, 73.5 metre Siren has a myriad of onboard highlights, such as a helipad, an expansive sundeck complete with a lounge area and a sea pool surrounded by sunpads, while a bar and al fresco dining can be found on the main deck aft. Below deck, she boasts a movie theatre, a vast and contemporary main saloon with dining area, an owner's office and an elegant skylounge. Managed for charter by Burgess, Siren has a weekly summer rate starting from €553,000 in the low season and €623,000 in the high season. During winter, she has a weekly rate starting from €490,000 in the low season and €550,000 in the high season. Having recently undergone an extensive refit, the spa on board 69.7 metre Sherakhan is a sight to behold. Decorated with beautiful mosaics, it features gym equipment, Jacuzzi, shower, sauna and beauty salon, complete with full-time on-board beauty therapist. Launched by Vuyk in 1966 and converted into a luxury yacht in 2005, her onboard highlights include an office/library with a fireplace, a seven metre high atrium dining room and accommodation for up to 26 guests in 13 cabins, with accommodation for a crew of 19. Up on deck, she features numerous loungers, an 18-person glass-bottom Jacuzzi and multiple dining areas. Y.CO manages Sherakhan for charter, which has a weekly rate starting from €425,000 in the summer, and $390,000 in the winter. Having recently undergone an extensive refit, the spa on board 69.7 metre Sherakhan is a sight to behold. Decorated with beautiful mosaics, it features gym equipment, Jacuzzi, shower, sauna and beauty salon, complete with full-time on-board beauty therapist. Launched by Vuyk in 1966 and converted into a luxury yacht in 2005, her onboard highlights include an office/library with a fireplace, a seven metre high atrium dining room and accommodation for up to 26 guests in 13 cabins, with accommodation for a crew of 19. 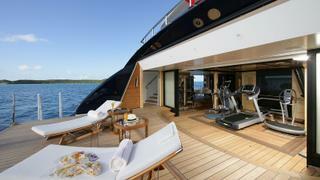 Up on deck, she features numerous loungers, an 18-person glass-bottom Jacuzzi and multiple dining areas. Y.CO manages Sherakhan for charter, which has a weekly rate starting from €425,000 in the summer, and $390,000 in the winter. Admire the view and smash out an adrenaline-pumping work out in 83.5 metre Savannah's fully-equipped gymnasium before heading to the spa to relax in the Hammam and to enjoy a massage or beauty treatment, courtesy of the on board masseuse and beautician. Delivered in 2015 by Feadship, she can sleep up to 12 guests in six cabins with a crew of 24. She boasts seemingly endless onboard highlights, but a few include an underwater observation lounge, stunning and capacious lounge spaces, a beautiful master suite with a skylight, an extraordinary swimming pool and a basketball court. Managed for charter by Edmiston, she has a weekly rate starting from €1,000,000. Admire the view and smash out an adrenaline-pumping work out in 83.5 metre Savannah's fully-equipped gymnasium before heading to the spa to relax in the Hammam and to enjoy a massage or beauty treatment, courtesy of the on board masseuse and beautician. Delivered in 2015 by Feadship, she can sleep up to 12 guests in six cabins with a crew of 24. She boasts seemingly endless onboard highlights, but a few include an underwater observation lounge, stunning and capacious lounge spaces, a beautiful master suite with a skylight, an extraordinary swimming pool and a basketball court. Managed for charter by Edmiston, she has a weekly rate starting from €1,000,000. The beach club on board 84.73 metre O'Ptasia, which will be delivered straight to the charter market later this year, features a steam room and massage room, while an expansive gym can be found up on the bridge deck, complete with separate access sliding doors out to the deck. Additionally, there is a salon area on the lower deck. Built by Golden Yachts, O'Ptasia can sleep up to 12 guests in 11 cabins, which includes a luxurious owner's suite complete with study, walk-in wardrobes and 180-degree views and a vast VIP suite with an adjoining cinema room. Additionally, she boasts a helipad, waterfall Jacuzzi surrounded by sunpads and plenty of al fresco dining spots. 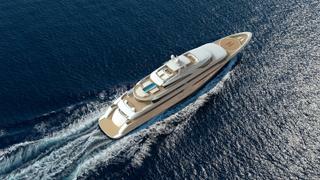 O'Ptasia is managed for charter by Atalanta Golden Yachts and has a weekly rate starting from €800,000. The beach club on board 84.73 metre O'Ptasia, which will be delivered straight to the charter market later this year, features a steam room and massage room, while an expansive gym can be found up on the bridge deck, complete with separate access sliding doors out to the deck. Additionally, there is a salon area on the lower deck. Built by Golden Yachts, O'Ptasia can sleep up to 12 guests in 11 cabins, which includes a luxurious owner's suite complete with study, walk-in wardrobes and 180-degree views and a vast VIP suite with an adjoining cinema room. Additionally, she boasts a helipad, waterfall Jacuzzi surrounded by sunpads and plenty of al fresco dining spots. 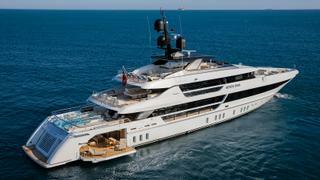 O'Ptasia is managed for charter by Atalanta Golden Yachts and has a weekly rate starting from €800,000. 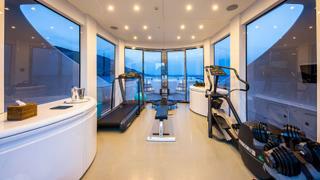 Plunge straight into the sea after your stint in the beach club gym and spa on board Amaryllis, the former of which features a treadmill, spinning bike, versa climber, elliptical cross-trainer, powerplate and rowing machine. The 78.43 metre Amaryllis was delivered in 2011 by Abeking & Rasmussen and can sleep up to 12 guests in six cabins with a crew of 23. On board, she features multiple lounges, one of which has a grand piano, a circular dining room, a cinema lounge, a beautiful study and a stunning owner's deck complete with its own private terrace. Additionally, her sundeck boasts a five metre swimming pool with colour change lighting, as well as numerous lounge and dining areas. Managed for charter by Hill Robinson, during the summer season she is available in the UK with a rate starting from €695,000 and during the winter season, she will be available in the Caribbean with a rate starting from $770,000. Plunge straight into the sea after your stint in the beach club gym and spa on board Amaryllis, the former of which features a treadmill, spinning bike, versa climber, elliptical cross-trainer, powerplate and rowing machine. The 78.43 metre Amaryllis was delivered in 2011 by Abeking & Rasmussen and can sleep up to 12 guests in six cabins with a crew of 23. On board, she features multiple lounges, one of which has a grand piano, a circular dining room, a cinema lounge, a beautiful study and a stunning owner's deck complete with its own private terrace. Additionally, her sundeck boasts a five metre swimming pool with colour change lighting, as well as numerous lounge and dining areas. Managed for charter by Hill Robinson, during the summer season she is available in the UK with a rate starting from €695,000 and during the winter season, she will be available in the Caribbean with a rate starting from $770,000. Stay in shape on your summer vacation in the Med this summer – Sovereign features an array of exercise equipment set up in the beach club including a treadmill, free weights, yoga mats, bands, and balls. Delivered in 2011 by Newcastle Marine, the 54.9 metre superyacht features six cabins for up to 12 guests, who will be looked after by a crew of 12. Her highlights include two master cabins, one of which boasts a private terrace. Additionally, there is a comfy main saloon, a spacious skylounge with high ceilings, uninterrupted views and a cocktail bar, and a capacious sundeck complete with a bar area, Jacuzzi, loungers and sunpads. Sovereign is managed for charter by Worth Avenue Yachts and has a weekly rate starting from $250,000. Stay in shape on your summer vacation in the Med this summer – Sovereign features an array of exercise equipment set up in the beach club including a treadmill, free weights, yoga mats, bands, and balls. Delivered in 2011 by Newcastle Marine, the 54.9 metre superyacht features six cabins for up to 12 guests, who will be looked after by a crew of 12. Her highlights include two master cabins, one of which boasts a private terrace. Additionally, there is a comfy main saloon, a spacious skylounge with high ceilings, uninterrupted views and a cocktail bar, and a capacious sundeck complete with a bar area, Jacuzzi, loungers and sunpads. Sovereign is managed for charter by Worth Avenue Yachts and has a weekly rate starting from $250,000. The stunning 55 metre Amels LE 180 yacht Lili is a fantastic option for gym bunnies heading out on a charter vacation – she boasts an up-to-date gym area as well as spa facilities on board. Out on deck there is a open-air cinema, four-metre pool with counter-flow current and plenty of seating areas perfect for a sunset cocktail. Below deck, her contemporary main saloon features a vast television and dining area, a second main deck saloon offers a fold-down balcony, and guests can also relax in a spacious skylounge. Imperial Yachts manages Lili for charter, with a weekly rate starting from €290,000. The stunning 55 metre Amels LE 180 yacht Lili is a fantastic option for gym bunnies heading out on a charter vacation – she boasts an up-to-date gym area as well as spa facilities on board. Out on deck there is a open-air cinema, four-metre pool with counter-flow current and plenty of seating areas perfect for a sunset cocktail. Below deck, her contemporary main saloon features a vast television and dining area, a second main deck saloon offers a fold-down balcony, and guests can also relax in a spacious skylounge. 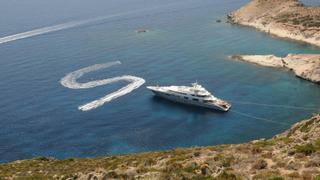 Imperial Yachts manages Lili for charter, with a weekly rate starting from €290,000. 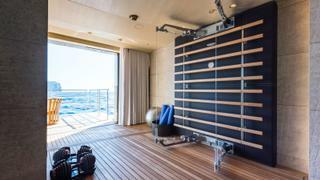 Apogee offers active guests a beautiful sundeck gym with the latest equipment, air-conditioning and panoramic views, as well as a vast spa tub on the sundeck. Other on-deck features include a sundeck that is ideal for evening parties, an expansive bar and dining area and numerous sunbathing spots. Her luxurious interiors feature an opulent main saloon and dining area, a vast cocktail lounge with bar, games table, jukebox and disco set-up. Delivered in 2003 by Codecasa and refitted in 2013, the 62.3 metre superyacht can sleep up to 12 guests in six cabins with a crew of 17. Managed for charter by Thompson, Westwood & White, she has a weekly winter rate starting from $275,000 in the low season and $325,000 in the high season. During the summer, her weekly rate starts from $300,000. Apogee offers active guests a beautiful sundeck gym with the latest equipment, air-conditioning and panoramic views, as well as a vast spa tub on the sundeck. Other on-deck features include a sundeck that is ideal for evening parties, an expansive bar and dining area and numerous sunbathing spots. Her luxurious interiors feature an opulent main saloon and dining area, a vast cocktail lounge with bar, games table, jukebox and disco set-up. Delivered in 2003 by Codecasa and refitted in 2013, the 62.3 metre superyacht can sleep up to 12 guests in six cabins with a crew of 17. Managed for charter by Thompson, Westwood & White, she has a weekly winter rate starting from $275,000 in the low season and $325,000 in the high season. During the summer, her weekly rate starts from $300,000. Wander forward on board Mia Elise II and you'll find a beautiful air-conditioned gym, sauna and steam room so that you can really enjoy some time to yourself during your charter vacation. For those who enjoy balance while on vacation, there's a beautiful cocktail bar at the heart of a circular wine cabinet, which leads into the main saloon/piano lounge and dining area. Delivered in 2012 by Trinity Yachts and refitted in 2017, she can sleep up to 12 guests in seven cabins, which include a master suite complete with a private veranda, his/hers ensuites and an office. Heading outside, Mia Elise II has a spa pool, sunpads and bar on the sundeck, with al fresco dining and lounge areas below. IYC manages Mia Elise II for charter, which has a weekly rate starting from €430,000 during summer and $430,000 during winter. Wander forward on board Mia Elise II and you'll find a beautiful air-conditioned gym, sauna and steam room so that you can really enjoy some time to yourself during your charter vacation. For those who enjoy balance while on vacation, there's a beautiful cocktail bar at the heart of a circular wine cabinet, which leads into the main saloon/piano lounge and dining area. Delivered in 2012 by Trinity Yachts and refitted in 2017, she can sleep up to 12 guests in seven cabins, which include a master suite complete with a private veranda, his/hers ensuites and an office. Heading outside, Mia Elise II has a spa pool, sunpads and bar on the sundeck, with al fresco dining and lounge areas below. IYC manages Mia Elise II for charter, which has a weekly rate starting from €430,000 during summer and $430,000 during winter. With plenty of space for guests to enjoy yoga or Pilates, 50 metre Trending also features a TRX machine up on the sundeck, which sits conveniently close to the oversized Jacuzzi, perfect for a post-workout soak. Guests can relax at the sundeck bar or atop the sunpads around the Jacuzzi. Trending was delivered in 2006 by Westport and refitted in 2016 – she features a beautiful skylounge complete with a cocktail bar and fold-down balcony, a private sutdy, an elegant dining room and a beautiful main saloon with full-length sliding glass doors out to the aft deck. She can sleep up to 12 guests in six cabins with a crew of 11. Camper & Nicholsons manages Trending for charter, which has a weekly rate starting from €210,000 in the summer season and $200,000 in the winter. With plenty of space for guests to enjoy yoga or Pilates, 50 metre Trending also features a TRX machine up on the sundeck, which sits conveniently close to the oversized Jacuzzi, perfect for a post-workout soak. Guests can relax at the sundeck bar or atop the sunpads around the Jacuzzi. Trending was delivered in 2006 by Westport and refitted in 2016 – she features a beautiful skylounge complete with a cocktail bar and fold-down balcony, a private sutdy, an elegant dining room and a beautiful main saloon with full-length sliding glass doors out to the aft deck. She can sleep up to 12 guests in six cabins with a crew of 11. Camper & Nicholsons manages Trending for charter, which has a weekly rate starting from €210,000 in the summer season and $200,000 in the winter. 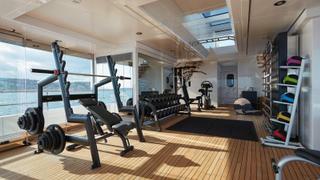 Enjoy a sailing charter on board Ree, the Captain of which is a fitness fanatic so regularly sets up a mini outdoor gym on her expansive deck. The 34.1 metre sailing yacht Ree was delivered in 1996 and can sleep up to 10 guests in five cabins. A cosy and elegant main saloon features a TV lounge and an office area. Al fresco dining can be found up on deck, alongside loungers and sunpads. She was delivered in 1995 by Valdettaro, boasts some strong green credentials and is now owned by Christian Ree. Managed for charter by Nicholson Yachts, Ree has a weekly rate starting from $52,000. Enjoy a sailing charter on board Ree, the Captain of which is a fitness fanatic so regularly sets up a mini outdoor gym on her expansive deck. The 34.1 metre sailing yacht Ree was delivered in 1996 and can sleep up to 10 guests in five cabins. A cosy and elegant main saloon features a TV lounge and an office area. Al fresco dining can be found up on deck, alongside loungers and sunpads. She was delivered in 1995 by Valdettaro, boasts some strong green credentials and is now owned by Christian Ree. 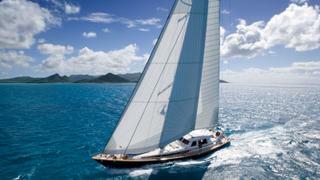 Managed for charter by Nicholson Yachts, Ree has a weekly rate starting from $52,000.